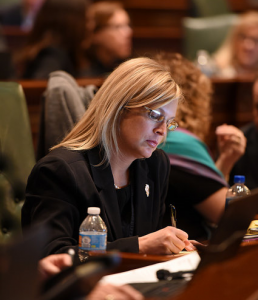 SAVANNA… State Rep. Tony McCombie (IL-71st) today announced that she has received her committee appointments for the 100thGeneral Assembly. The six committee appointments for Rep. McCombie include Transportation: Roads and Bridges, Business and Occupational Licenses, Tourism, Business Incentives for Local Communities, Cities and Villages, and Elementary and Secondary Education: Curriculum and Policies. Residents of the 71st District can learn more about legislation sponsored by Rep. McCombie during the Spring legislative session at her website at www.repmccombie.com.